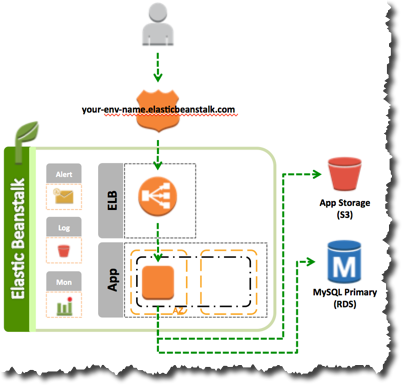 Welcome to the 4th part of this 5-part series where we’ll cover best-practices and practical tips & tricks for developing, deploying, and managing a web application with an eye for application performance and operational efficiency using AWS CloudFormation and Elastic Beanstalk. This week in the fourth part of the series we’re going to focus on the media aspect of our application, looking specifically at how to scale large volumes of video uploads to our application as well as conversion of those videos into thumbnails and formats suitable for streaming. Last week (blog post and Office Hours video) we explored approaches to managing application configuration – including storing config in S3 – as well as best practices for writing Java code that works well in any AWS region. If this is the first post you’ve read in the series, be sure to check out Part 1, Part 2, or Part 3 for more info on the app, including basic functionality and how to deploy it yourself. We’ll be discussing this blog post – including your Q&A – during a live Office Hours Hangout at 9a Pacific on Thursday, May 1, 2014. Sign up at https://plus.google.com/events/corm8as87g91mmlqhrc76iu1uj8. aMediaManager allows customers to store their videos. 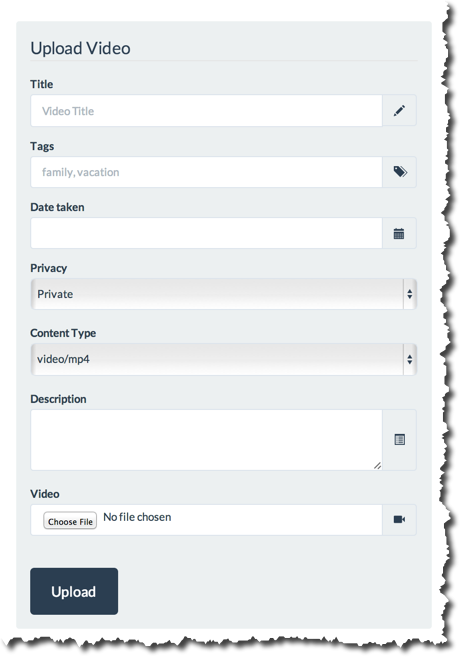 S3 is the logical place to put video content, and video metadata (i.e., owner, tags, S3 URL, created date, etc) will be stored in RDS, making it easy to search and query. How we efficiently and scalably get these videos from a customer’s computer to S3 is what we’ll focus on here. Cost: At the time of publishing, ELB charges $0.008 per GB of data processed, so there will be a data transfer cost (in addition to storage cost) associated with every video uploaded by your customers. Performance: Also consider that every video upload is another TCP connection your EC2 Instances have to handle. In the case of many uploads and/or long-running uploads, this will require you to scale your EC2 capacity to keep up. S3 is the right place to store videos, but you can create an HTML form that will POST files and forms directly to S3 (documented here), bypassing our environment’s ELB and EC2 instances entirely. After the video upload is complete, S3 will redirect the customer’s browser back to your application and you’ll have the opportunity to store metadata about the uploaded video into RDS. When the user completes the ‘Upload Video’ form in their browser and clicks Upload, the form POSTs directly to S3. The file is stored as an object in S3, and other important data in the form (i.e., any form field with the x-amz-meta- prefix) is stored as metadata attached to the video object. In this example, this includes hidden fields like the owner, as well as fields the customer filled out, including tags, date, and description data. Now let’s talk about how we transcode the video. After an uploaded video has been stored in S3 and its metadata recorded in RDS, the /video/ingest route in com.amediamanager.controller.VideoController schedules a transcoding job with Amazon Elastic Transcoder that will convert the video into a format suitable for streaming and generate thumbnail images. But before we can schedule a transcodig job, our application had to configure a Pipeline and Preset in Elastic Transcoder. 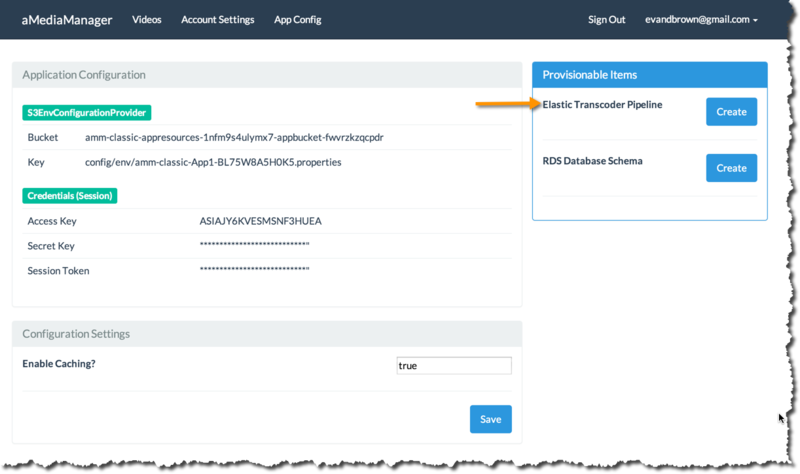 We used CloudFormation to provision almost every dependency (e.g., RDS, DynamoDB, etc) our application has, as of the creation of this application CloudFormation does not support creating and managing Elastic Transcoder resources. No problem, though. We’ll build a simple admin/config page and use the AWS SDK for Java to configure the Pipeline and Preset. 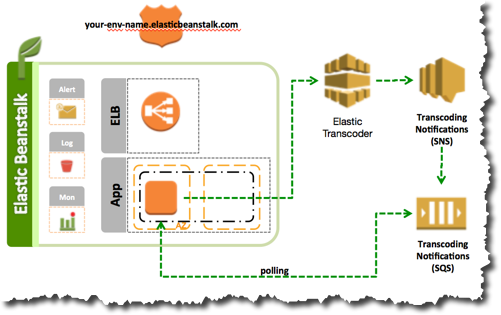 And do note that Elastic Transcoder is in the AWS Management Console; you could create the Pipeline and Preset resources using the UI, but we – of course! – want to automate all of this. The Notifications object we created above associates a Pipeline with an Amazon SNS Topic. When the status of a job submitted to a Pipeline changes (e.g., a transcode completes), Elastic Transcoder will publish a message to this SNS topic. We’ll talk more about that workflow in a bit. Among other things, this preset defines the output format of a transcoded video, as well as how to generate thumbnail preview images for a video. The ID of the Pipeline and Preset are important configuration values that every application server needs to know. Recall from Part 3 of this series where discussed how we store our application configuration file in S3. Our com.amediamanager.config.S3ConfigurationProvider class implements that method by persisting new config data to the config file in S3. After you’ve started a job with Elastic Transcoder, the service reports job status to the SNS Topic you defined when you created the Pipeline. CloudFormation created this SNS Topic when we deployed our initial template, and also created and subscribed an SQS Queue to that topic. So, when Elastic Transcoder publishes status messages to SNS, they ultimately get buffered to the Queue. First, don’t forget to join us for the live Office Hours Hangout later this week (or view the recording if it’s past May 1 2014 and you don’t have a time machine). 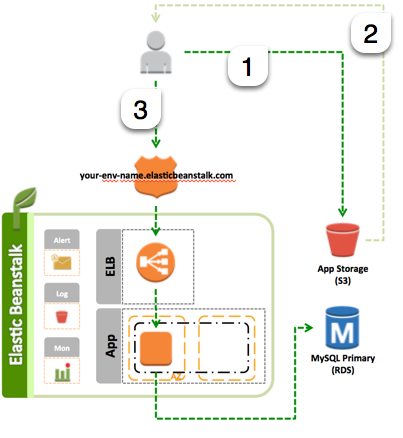 Next week in Part 5 of this series (blog post and Office Hours links forthcoming at http://blogs.aws.amazon.com/application-management) we’ll look at how to improve application performance with the use of RDS Read Replicas and ElastiCache clusters.